Here and There: So you wanna here about my trip to Ireland, etc? I think this is Grafton Street, a great place for shopping. Statue-ish thing right outside of St. Stephen's Green. There was sunshine! No more rain! Terribly focused (no on knows how to use my camera) but it's the first Guinness of the trip! Slainte! Ok, well I'll tell you. Sorry it's taken awhile to get this up here. I'm going to do this in installments as there's lots to tell. So I left Lyon on Saturday, the 23rd of February with just a backpack (a normal one, not a backpacking one) for 8 days of travel to Dublin, London, and Paris...it was quite an accomplishment for me :) I met 3 other girls---Karina from Georgetown, Catherine who goes to uni in Vancouver and Louise from New Zealand---at the train station in Lyon to take a train to Grenoble, a small town not too far from Lyon, to catch our "cheaper" flight out from the airport there. The ride was less than 2 hours, and once we got to Grenoble we then had to take about a 40 minute bus ride to the airport. And this aiport was TINY--people were just crammed everywhere, and everyone had these terrific sunburns/tans from skiing since the alps aren't too far. They seemed to be mostly Brits and other English speakers down for holidays. Anyways we waited there for about 2 or 3 hours until our flight finally came (never take Ryan Air!!!). There was no announcement of a delay of any sort, nope! After being randomly told that I was a "jeune fille avec beaucoup de charme" (basically a young girl with charm) by a creepy security guard, we progressed into the waiting area and just sat for an additional hour hoping we hadn't misunderstood any of the thick-accented announcements in english that were happening periodically amid the roar of too many voices of too many people crammed into this tiny waiting area. Finally our plane came and we arrived in Dublin around 11pm. One girl went to her hostel for the night while me and two others took a bus to UCD (University College of Dublin) where we were going to stay that night with a friend of one of the girls that I was with. It felt so weird being on a real college campus again because I don't know if I've mentioned this, but Lyon 3 is actually an old tobacco factory, "la manufacture tabac" or "la manu" for short, so it's actually quite tiny and doesn't feel anything like what I'm used to a college campus being like. In fact, it's quite ugly, haha. Anyways, we stayed up talking to this guy we were staying with and his German roommate, explaining such things to him as March Madness and why Karina (who is Indian) and I are so dark even though we're American...haha. We woke up to see the most amazingly green grass you'll ever see in your life. I just love that about Ireland. We made our way by double-decker bus to the City Centre (downtown basically) to catch another bus so that I could check into my hostel. Just to warn you---if you ever go to Dublin, do not expect a good transportation system...at all. Lots of connections and you have to pay for each bus each time...That being said, it was coollldddd out that day. It was actually pretty cold everyday in Ireland, but the reason it was so cold was because of the ridiculous wind and---yep, humidity. The humidity pretty much made you feel like you hadn't put on tights, pants, a sweater, a coat, a huge scarf on and gloves. Yikes. We went to my hostel called "The Brewery Hostel" to check in and Dave, the long-haired nice Aussie, checked me in. It was a smaller hostel, kind of like an old house with 4 large floors with about 6 bunk beds and an ensuite bathroom in each room. The coolest part was this large comfy common room with a bunch of nice big couches and tables and a free computer where peolple just hung out day and night. There we met up with Kim and Cristina who had just gotten in from Amsterdam, and we headed to the National Museum taking the scenic route down Grafton street by the Molly Malone statue. The National Museum was pretty awesome. They had artifacts ranging from ancient gold celtic jewelry that was unlike anything I've seen to Vikings artifacts from when they were in Ireland to....my favorite part...BOG BODIES! 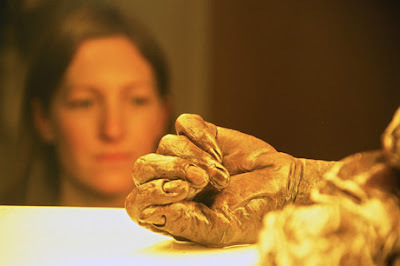 You should really read up on these things---They are these 2,000 year old bodies that were found in bogs in Ireland that are amazingly-well preserved. Experts are not quite sure what happened to these people, but it seems that they were tortured and killed for sacrificial reasons. Anyways, you just go and look at these bodies in glass cases right in front of you...I've got to admit, it's pretty creepy. Basically though, the museum taught me that Ireland has a very very ancient history that I had no idea went as far back as it does. Later that night we went to Temple Bar, a really touristy area of bars and the Temple Bar, and of course what nationality was the group of guys that we ended up next to? French. They were Parisien in fact. We cannot escape these French people :) So we got to practice our French some in Dublin even though they were in Dublin to practice their English...c'est la vie. We also met some hilarious Italians from Torino who were using us to practice their English as well. I've never seen anyone gesticulate like these Italians...hilarious! Anyways, we made our way back to the hostel where I went to sleep I cuddling with my purse that had my camera in it since there were no lockers. Interesting hostel, this was. Donc, c'est tout pour maintenant. Je vais finir vous expliquer mes aventures plus tard quand je suis pas si fatiguee. A bientot!